Sneak in some restorative time during your next work trip. If you travel often for business like I do, you know it can be draining: long days, hectic meeting schedules, time spent cooped up in airplanes. But alongside there are perks: new places to experience, connections to make, comfy hotel beds to collapse into. So, during my last industry conference in Toronto, Canada, I decided to extend the trip a couple of days and take some time out. I booked extra nights at my hotel to follow the conference and packed my bag with business attire – I stick to neutral colours to make life easy – plus some items just for me: tea, travel kettle, protein bars, flax eye mask, a journal and my yoga mat. This particular hotel was perfect for an urban retreat as it is home to SpaZen, an oasis tucked away on the 4th floor. I relaxed with a tea in their quiet, glass-enclosed solarium with the look and feel of a Japanese garden, where only the sound of water falling could be heard (a Jacuzzi was available for a pre-treatment soak which I will be sure to take advantage of next time). From the spa menu, I chose their signature mani-pedi, a relaxing experience involving exfoliation, hydration and oil and warmed stones. Bliss. Back in my room, I had already picked up healthy take-out from a local whole foods deli so I could stay in. After eating in conference halls and restaurants late at night, it was a welcome change! I sipped detoxifying tea, did yoga and meditation (grateful for the Insight app) and slept, soundly. 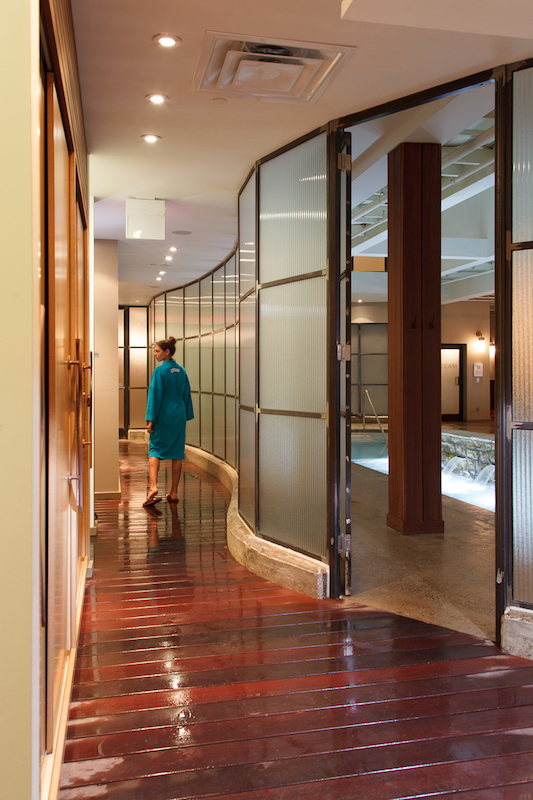 I also took the opportunity while in Toronto to book into Body Blitz for a body scrub, where the age-old tradition of communal bathing allows women to come together while ‘taking the waters’ in a bathing suit-optional, female-only environment. 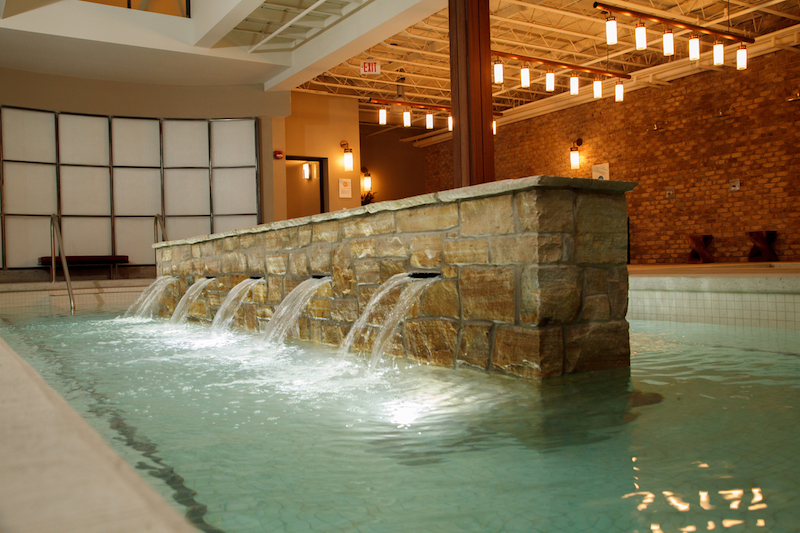 All treatments include access to the waters, so I spent 90 minutes winding down in the therapeutic waters circuit, with a warm Dead Sea salt pool, hot Epsom salt pool, and cold plunge pool plus eucalyptus steam room and infrared sauna. The entire circuit is housed in large indoor space reminiscent of an ancient Roman bathing house. Showers, lockers, towels, a robe and sandals are all included, and while talking is permitted, hushed voices are encouraged. While lounging, you can call up to the desk and order a tea or a fresh juice for sipping. Afterwards, I met my lovely esthetician who led me to a tiled treatment room for a signature full-body scrub, where I stripped down to nothing but the disposable thong provided. I choose the sweet ginger scrub, formulated with minerals rich in salt and essential oils to eliminate toxins and reduce inflammation. My skin was cleansed, exfoliated and stimulated front and back in an incredible series of scrubbing and rinsing, with low lighting and warm water to soothe and relax.